Like my mother before me, there’s nothing I enjoy doing more with my girls than sitting together in a chair and reading a stack of children’s books. It’s the physical closeness of snuggling up and the satisfaction of holding their attention, not to mention the pat on the back I can give myself for bolstering their intellectual development. More than anything, though, it’s planting the seed of my greatest passion, a love for reading and learning, and watching it grow right before my eyes. My oldest, Eloise, is now 2 ½, but my collection of books intended for her began long before her existence was even imagined. I’d head to the bookstore looking for a new piece of fiction but I’d almost always end up in the children’s section. While finding an interesting and original piece of adult literature can sometimes feel like looking for a needle in a haystack, finding a good picture book is more like sampling flavors at a gelateria: nearly every book will be enjoyable but a few you’ll want to read time and time again. Those are the books I’m hunting for and, once found, want to share with you. I love a book that’s visually stimulating with punchy writing. I adore an author who can insert humor for adults. I value a book that teaches – vocabulary, history, morals – but does so subtly. Cows that type! Hens on strike! The book that started my collection has and does all of these things. I came across “CLICK, CLACK, MOO: Cows That Type” seven years ago in the University of Missouri bookstore. A journalism student in the midst of my first semester on the newspaper staff, I had spent more hours over a keyboard than I could count and I felt an immediate kinship with these stenographically-talented farm animals. Author Doreen Cronin, who collects antique typewriters, uses simple, unembellished text to describe the comical negotiations between Farmer Brown and his livestock over their demands for electric blankets. Cronin hints at her day job as an attorney, adding splashes of legal lingo: cows going on strike, a duck serving as a neutral party and the delivery of an ultimatum. A 2001 Caldecott Medal winner, the book’s witty storyline is perfectly complemented by its bold and amusing illustrations. Artist Betsy Lewin began each picture with striking black brush drawings, over which she applied vivid watercolor washes; the color palette is eye-catching to say the least. Better yet is the humor she captures in the expressions and movements of the characters. 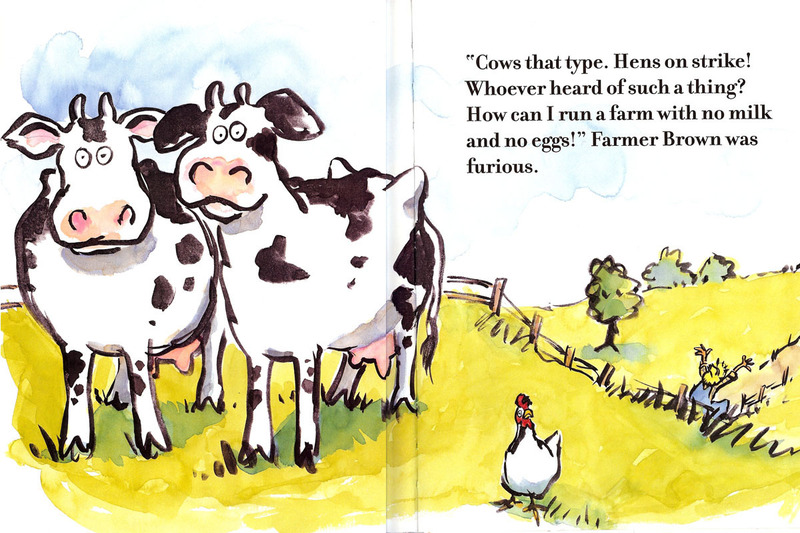 I love the exasperation in Farmer Brown’s exaggerated body language and the feigned innocence in Duck’s eyes. Together, Cronin and Lewin’s talents are a recipe for a perfect children’s book. It’s no surprise sequels in the saga of Farmer Brown’s farm are equally successful. “Giggle, Giggle, Quack” takes a look at the mischief Duck causes when Farmer Brown goes on vacation; it shares the same subtle humor and perfectly paced text. “Duck for President” is a little wordier, its humor possibly a bit above the heads of younger readers, but I love its message that being in charge isn’t always as great as it seems. “Dooby, Dooby, Moo” didn’t have the same laugh-out-loud moments I enjoyed in the previous books, so we don’t have a copy of it in our at-home library. However, I do plan to pick up a copy of “Thump, Quack, Moo,” the latest installment about Farmer Brown’s construction of a corn maze. I’m so thrilled about this blog, and plan to make it a frequent stop! I feel so overwhelmed when I’m looking for a good children’s book at the book store…now I have a place to turn to! Amanda, you are the ultimate authority on children’s books…every book you’ve given August has immediately become a favorite (for audience and reader alike), and he absolutely loves when you visit and read to him! Great website and excellent review! Amanda-This is amazing even for those who don’t have kids.